A long time (first time) fan of the show, it was an absolute delight and an honor to perform on the RISK! storytelling stage in Los Angeles last winter. A show whose impish premise is grounded in “true stories you never thought you’d dare to share,” my story came from an original idea I workshopped with The Moth GrandSLAM in October of 2018. The version on this RISK! show, “The Album Cover,” was expanded from that original performance, with thanks to Master Instructor Larry Rosen for his notes and guidance. Whenever I’m on stage, I can’t help but lose myself in the story I’m crafting for the audience in real time. I hope it feels real and immediate for them. Sometimes, the emotions of whatever I was feeling in those moments within those stories, those past lives, will finally catch up with me behind the microphone. Sometimes they surprise me. The story above was a special performance for me, one that I’m thankful I’m able to share thanks to my friends at RISK! ; LA producer Beowulf Jones and Executive Producer/Founder, Kevin Allison. Special thanks to the storytellers I shared this episode with, Mike Cho and Leland Carina. Thank you for your honesty and vulnerability. As always, thank you for taking the time to listen. It means more than I can ever express on my blog! 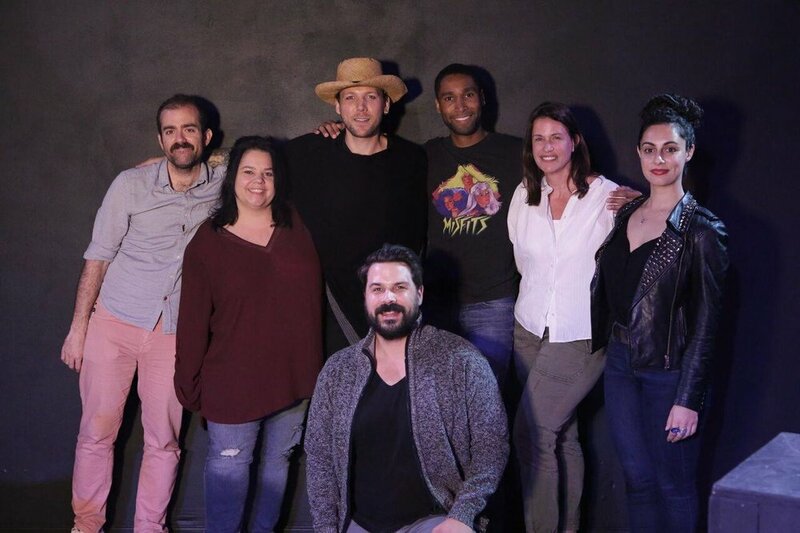 The evening’s storytellers receive a warm round of applause at the conclusion of another Moth GrandSLAM in Los Angeles, October 22nd, 2018. (From left to right: Host Brian Finkelstein, storytellers Matthew Struski, Jade Driggers, Rich Tackenberg, StorySLAM producer Gary Buchler, Richelle Meiss, Hana Nobel, Ron Hart, Emma Horn & me.) Photo credit: Ricky Steel, courtesy of The Moth. 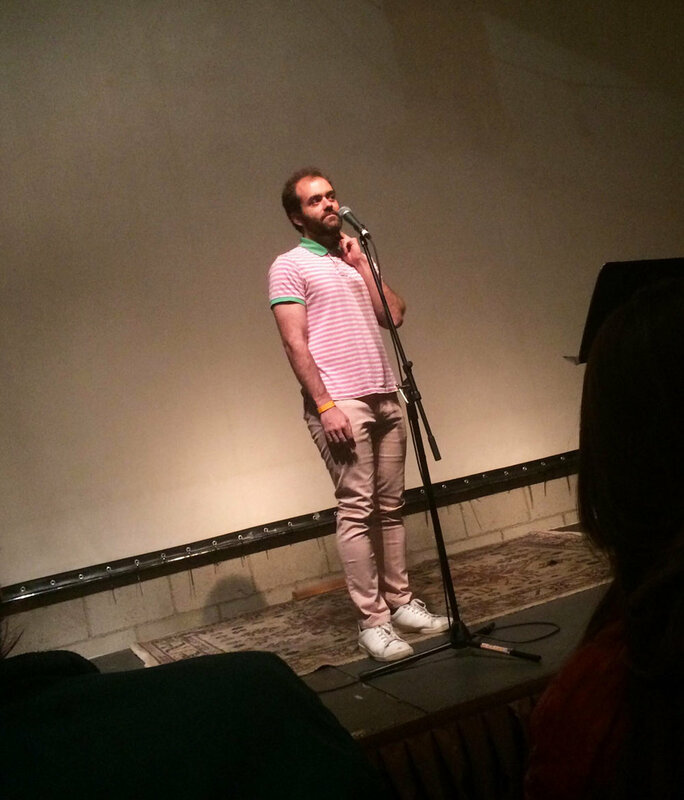 My memories are still humming from a wonderful evening of storytelling shared with The Moth. The photograph above (by Ricky Steel), taken moments after the winner was announced (go Ron! ), gathered all of us together on stage to receive a warm round of applause from the audience. Huddled shoulder to shoulder out there in the darkness were a handful of my friends and my mother, who drove in from Phoenix the day before. I was honored to share such a special night with those closest to me, as well as my growing community of fellow storytellers & writers whom I continue to be inspired by. Picking apart my second draft, in longhand, for my upcoming performance at The Moth GrandSLAM later this month. “Do you always carry a notebook with you?” my friend Stuart asked, nodding towards what was tucked underneath my right arm. I smiled. “When I got something on my mind, yeah.” We were both checking audience members in at the door of Los Globos, a bar in Silver Lake which hosts The Moth’s open mic every other Tuesday night. He, with a trained eye checking off names on a printed out list of RSVPs, I, trading my notebook for a rubber hand stamp in the shape of the show’s namesake. “After someone complained we were using a butterfly, we had this one made up,” Stuart added, tapping his index finger atop the stamp’s pair of wings printed on its handle. While we greeted each person at the door, we traded stories with each other, broken up by the intermittent stream of faces and the exchange of money. Fitting, that, even after setting my notebook down on the red vinyl seat behind me, I couldn’t help but keep writing out loud. I had a lot on my mind, after all. Currently, I’m preparing a story for my first GrandSLAM with The Moth. Different from their StorySLAMs, open mics where anyone from the audience can go up and tell a story, I know the stage at The Regent Theatre is waiting for me. This show, made up of winners from previous StorySLAMs, are each given an allotment of time to craft an original story: Five minutes, which can go by in an instant. I’ve discovered, in the relatively short time that I’ve been working on storytelling, that a simple phrase spoken in the moment can speak volumes as opposed to the written word. Sharp observations can cut deeper than a paragraph of prose, and eases up on the pressure you feel on stage when you have to deliver a story under time. Storytelling also has the benefit of having the embodied vessel of the experience (the storyteller on stage) imbuing the story with a built-in reference for the audience. Trusting what truly needs to be said, is always a balancing act. I have a habit of writing too much. I’m far too generous with my adjectives and can often get carried away (as blog posts are often want to do). Storytelling, as opposed to literature, has the unique imperative of requiring one strip away all artifice to make themselves truly effective on stage. If you allow your story to become impenetrable to your audience by having moments feel overly engineered as opposed to “in the moment,” creating a sense of intimacy between you and your listener can become more difficult than it needs to be. Sometimes, habits that work for writers at their desks, need to take a backseat upon switching modes of presentation. On stage at “Bada Bing Bada Boom: True Stories Told for Cash” at The Actor’s Company; West Hollywood, October 4th, 2018. Photo by Melanie Chapman. 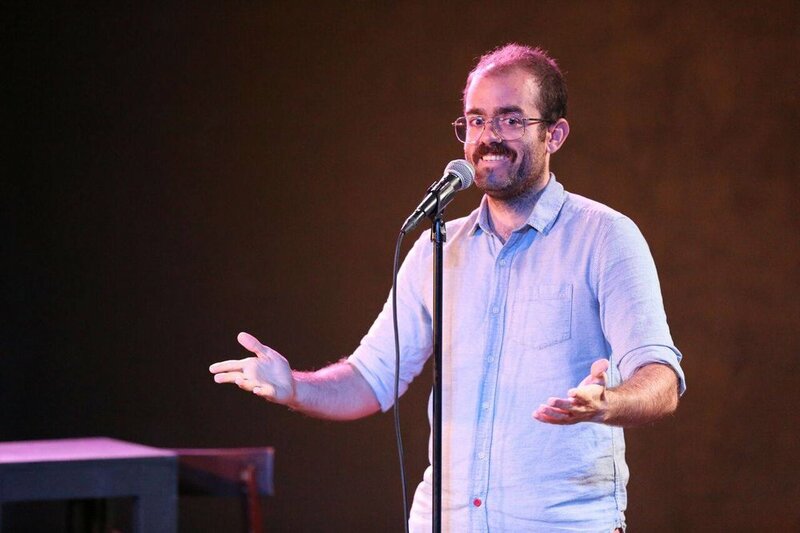 I experienced this sense of disconnect during a performance of mine at “Bada Bing Bada Boom: True Stories Told for Cash” last Thursday night, where I was invited up to compliment the lineup of invited storytellers. Perhaps due to short notice, I performed a story I had already written, its beats sharpened over years of telling it before. 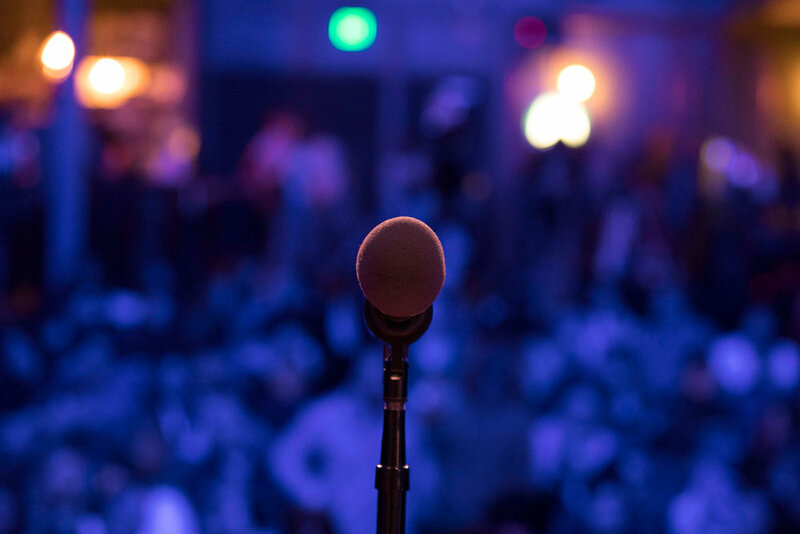 Instead of feeling comfortable on stage, I felt I had lost a step in revisiting it in front of an audience, choosing to rely on what had worked before as opposed to finding fresh perspective on what might work “now.” I was able to execute the beginning, middle and end, but felt some invisible energy was missing in the spaces between. After sitting back down, I was inspired by the others who went up, able to connect with the audience by relating their stories to their current, tactile realities. It was that missing energy, linking their pasts with the present in an effortless, unrehearsed way. Looking back, a lesson for me would be that, you can always find new opportunities to shake up an old story by straying from what feels safe towards what feels real, what activates your mind behind the microphone. That’s where those crucial connections with the audience take place. Until then, as I wait for my impending GrandSLAM, I’ll return to my notebook (acting as my mousepad at the moment) to whittle away what needs to be said and what I can stand to lose in the process. Humbled by the opportunity to share a new story at the upcoming The Moth GrandSLAM in Los Angeles: October 22nd at The Regent theatre. Having listened to its podcast since college, I can't wait to do my best to honor the stage that has entertained & inspired me for nearly a decade. To all those who've inspired me to tell my truth, boldly: Thank you. This one's for you. I will be performing a story for Vinyl Voices in Phoenix, AZ alongside storytellers Melissa Fossum, Davina Griego, Jon Kirby & Robrt Pela on September 27th. The conceit of the show is really fascinating: You bring a vinyl record, the DJ plays a track of your choice, and you tell a story based on that song. It's an evocative, communal experience - one that I'm honored to be a small part of. Vinyl Voices is a monthly storytelling show at The Coronado in downtown Phoenix. For more information, please visit thecoronadophx.com.